Polysafe blocks have been used by Broadland District Council to control access to a field on Rosebury Road in Norwich. 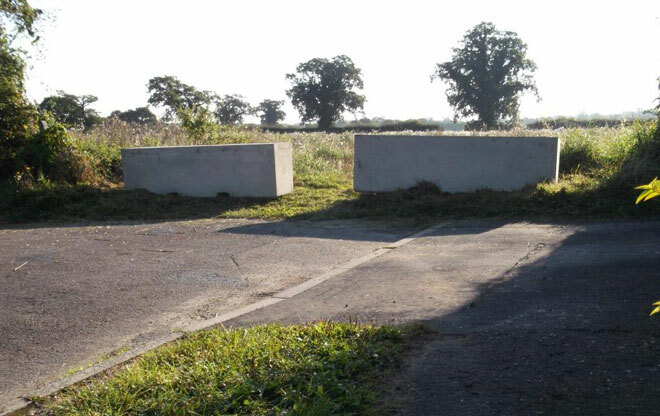 The rectangular concrete blocks were placed at the entrance to the road to stop vehicles driving over the field. Broadland were pleased with the service provided by Polysafe. Mark Siddall commented: "The delivery arrived bang on time and all was sorted." Polysafe concrete barriers are a great way to protect vacant land from vehicles and trespassers. The blocks and barriers come in a range of shapes and sizes to suit different applications. We also offer barrier hire if you only require barriers temporarily. For more information please call the Polysafe Barriers and Blocks sales team on 01778 560555 or visit our contact page.